In history, things happen that make you sick to your stomach, like the queasy feeling you get when your child or grandchild is at risk during war. Since 1973, America has had an all-volunteer armed force, created in the final years of the costly Vietnam War. Over 56,000 Americans died in Vietnam and over 150,000 were wounded from the war’s quiet beginning in 1955 to its bitter end 20 years later. When you remember the Vietnam war draft, you can understand the rage that Americans felt. When you walk by the memorial in Washington, you well up with pride and remorse over those who perished in a war that the government, as we know now, never had a real plan to win. Acknowledging that many of those who died were drafted leads us to an important piece of history: the heavy toll in Vietnam became a political liability, forcing the government to suspend the draft and go to Plan B. 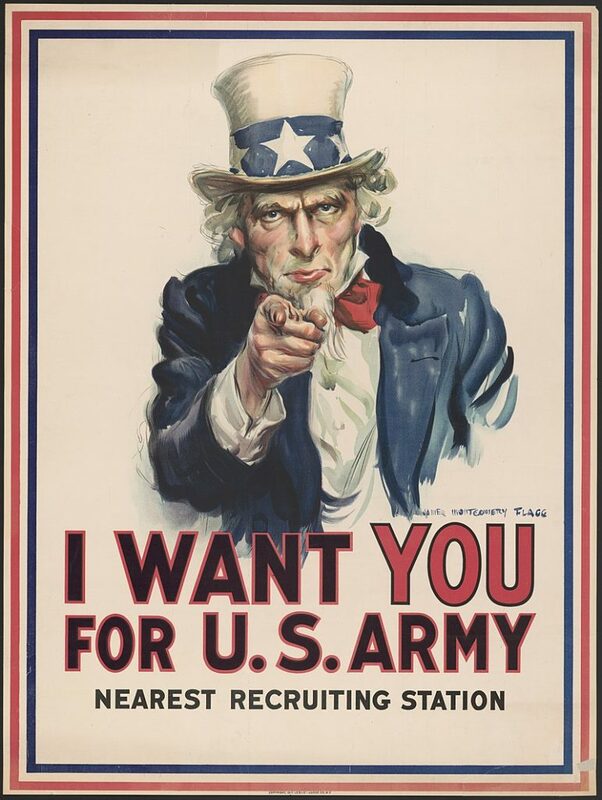 The Draft, currently administered by the Selective Service System, has been used in five American wars to conscript men into the armed forces when there are not enough volunteers. The draft was effective in the Revolutionary War, the Civil War, World War I, World War II and the Vietnam War. The Selective Service System still exists: all men from 18 to 25 are currently required to do a simple registration. The names of these men are listed, just in case. Just in case are the words that make this story so important. Since the creation of the all-volunteer forces, they have been deployed in 13 wars or skirmishes, including some unusual ones. The first President Bush sent 20,000 men and women into Panama to arrest Panamanian dictator Manuel Noriega. 23 Americans died, and they are largely forgotten. That casualty figure pales by comparison to the toll in the second Iraq war. The men and women of the volunteer defense forces have performed with exceptional courage in extremely difficult situations. A dynamic example of the challenge was the second war against Saddam Hussein in Iraq, beginning in 2003. Over 5,000 of our fellow Americans were killed and 22,000 were wounded in what evolved into a civil war. Iraq then morphed into an incubator for other regional conflicts, including the creation of ISIS and other organizations obsessed with death and terror. The War in Afghanistan seems more justified because it was in retaliation for the horrific acts of 9/11/01. A total of 2,218 Americans have died in combat in Afghanistan, another 21,000 wounded. In total the all-volunteer forces lost over 17,000 since its inception. Before I look at the future, a question: do you think the Presidents who utilized the volunteer forces to fight wars in the last 45 years would have gone to war if the draft were still active? The answer is a resounding no. Would George W. Bush committed all those troops to a war whose pretense was “weapons of mass destruction” if there were a draft? The answer is a resounding no. The American public would have never tolerated it. The concept of an all-volunteer military force made it much easier for Presidents to engage in military conflict without having to face the wrath of the voting public. And here we are in 2018. The world is a dangerous place. Although the Donald Trump summit with Kim Jong-un offers some hope, the Middle East is an explosion waiting to happen. Any number of military mistakes or flash points could lead to a wider conflict. The United States has defense obligations to Israel, the only real Democracy in the Mideast. Iran is a dangerous political mix of passion, power and a messianic mission (among its leaders) that has spread to the entire region. The Arab countries of Saudi Arabia, Jordan and the Emirates fear the Iranian ambitions. Some feel that the President’s exit from the nuclear deal is a very dangerous business. Along with these growing dangers, especially involving the regime in Iran, we get assorted reports by think tanks, military strategists, and local recruiters that it is getting harder and harder to fill the ranks of our volunteer services. Congressional sources I’ve counted on for years confirm the fear that if things get worse, the United States will have to go back to the draft. With Donald Trump, for better or worse risking a wider war in the Middle East, can we cope with what would be a major troop commitment? If Israel and Saudi Arabia are threatened, will our recruiting efforts hold up to meet our need? Will Vladimir Putin, the world’s biggest troublemaker, challenge us in Eastern Europe as Iran tries to surround Israel? Can we fight wars on two fronts? Or will Selective Service spring into action and start drafting young men? And what about the honorable and courageous warriors who have survived, and are surviving, suffering the physical and emotional scars of war? If the U.S. should bring back a draft, where does that leave those who stood up and volunteered all these years? It is bad enough that the Veterans Administration has failed the heroes to whom we owe our freedom. These are important questions, all of them. As a nation, we are slow to take preemptive actions, whether it’s the scarcity of water, the danger of weapons in the wrong hands, or the health of our volunteer army. Congress lives in a dream world vacant of ideas with a history of reaction to crises, rather than proactive research on the future. We need a thorough evaluation of our recruiting plans for our volunteer armed forces, as I said before, just in case. @larrykane is a 54 year veteran of reporting and anchoring the news. Responding to “The President Can End the Standoff With Mueller"